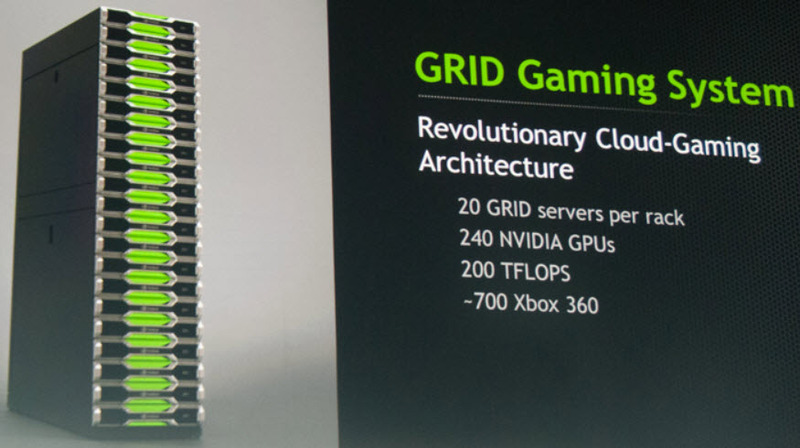 Back in May of last year NVIDIA unveiled the GeForce GRID cloud gaming technology. Looks like they weren't content with it and worked on a more holistic approach to cloud gaming. NVIDIA has now presented the results of their labor at a CES 2013 press conference helmed by none other than CEO Jen-Hsun Huang. NVIDIA's cloud gaming platform is now simply called NVIDIA GRID and is intended as a gaming system that will be installed in large quantities into massive data centers run by cloud gaming providers and services. NVIDIA GRID is NVIDIA's first fully integrated product and system. NVIDIA is demonstrating the NVIDIA GRID platform streaming games to an LG 55LA6900 Smart TV at 1080p resolution at the 2013 International CES event in Las Vegas. High-performance games that are being showcased include Battlefield 3, Medal of Honor: Warfighter and Need for Speed: Most Wanted - A Criterion Game from EA, Borderlands 2 from 2K Games, The Elder Scrolls V: Skyrim and Dishonored from Bethesda Softworks, Assassin's Creed III and Rayman Origins from Ubisoft, Super Street Fighter IV: Arcade Edition from Capcom, and Trine 2 from Frozenbyte. Looks like NVIDIA and LG are quite cozy together as the NVIDIA GRID cloud gaming platform was also showcased on an upcoming 4K LG Smart TV during NVIDIA's CES 2013 press conference. Both companies failed to announce any dates for NVIDIA GRID cloud gaming services coverage for LG Smart TVs at this time. LG is already employing cloud gaming for their TVs as they have partnered with OnLive to stream games from the cloud to LG Smart TVs with Google TV. "LG is very impressed by the capabilities of NVIDIA's GRID Platform to deliver high-quality game streams directly to LG Smart TVs without a game console," said Bae-Geun Kang, vice president, head of Software Development Group, TV Research Lab, LG. "The NVIDIA GRID cloud gaming experience on an LG 55LA6900 Smart TV is beautiful to watch, easy to use and fun to play. It is just like Netflix for games." 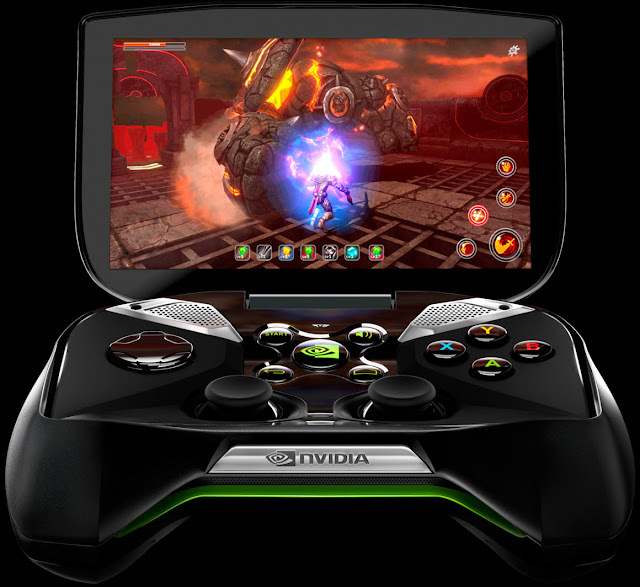 In a move that surprised many people NVIDIA also unveiled and demonstrated Project SHIELD, a portable gaming console for open platforms. Part of the unveiling was a gorgeous looking interactive presentation of Project SHIELD rendered by the brand new Unreal Engine 4 (UE4). NVIDIA certainly knows how to wow the audience. Since Project SHIELD is an open platform, gamers will of course be able to enjoy cloud gaming services like those powered by NVIDIA GRID and others like OnLive with NVIDIA's Project SHIELD. As a pure Android device, NVIDIA's Project SHIELD gives access to any game and app on Google Play which of course includes games from NVIDIA's curated TegraZone game store. And as a wireless receiver and controller, it can stream games from a PC powered by NVIDIA GeForce GTX 650 GPUs or higher, accessing titles from gamers' Steam game library from anywhere in the home and later on the go. Of course gamers can use the TV friendly Steam Big Picture mode with Project SHIELD able to stream video to the TV via HDMI and later wirelessly. At the core of Project SHIELD is what NVIDIA calls the world's fastest mobile processor, the new NVIDIA Tegra 4 which was also just unveiled at NVIDIA's CES 2013 press conference, and which delivers enormous power from its custom 72-core GeForce GPU and the first quad-core application of ARM's most advanced CPU core, the Cortex-A15. These, combined with its battery-saver core and energy-saving PRISM 2 technology, deliver hours of gameplay on a single charge. Project SHIELD combines the advanced processing power of NVIDIA Tegra 4, breakthrough game-speed Wi-Fi technology and stunning HD video and audio built into a console-grade controller. As mentioned, it can be used to play on its own integrated and foldable 5-inch 1280x720 HD screen or on a big TV screen, and on the couch or on the go. Project SHIELD is also capable of outputting 4K resolutions over HDMI to upcoming 4K TVs. Project SHIELD provides audio fidelity and dynamic range never before available on a portable device, through its custom, bass reflex, tuned port audio system -- with twice the low-frequency output of high-end laptops. NVIDIA stated that they will try to release the Project SHIELD portable gaming console in Q2 2013. For many years, NVIDIA has worked with leading supercomputer centers to build the fastest computers in the world, including the world record-holding Titan supercomputer. NVIDIA GRID leverages some of this same technology to render and stream games from the cloud, with thousands of NVIDIA engineers dedicated to creating the ultimate system for cloud gaming service operators. You can think of it as a gaming supercomputer in the cloud, built by NVIDIA. The NVIDIA GRID cloud gaming platform enables the smooth, seamless interactive experience of a high-performance gaming PC anywhere, on any screen -- including PCs, Macs, Smart TVs, tablets and smartphones. NVIDIA GRID software and drivers enable interactive streaming of the widest range of games -- from casual games using low-graphics capabilities with a high density of streams, to high-performance titles requiring high-graphics capabilities. NVIDIA claims that NVIDIA GRID delivers streamed content for seamless interaction without noticeable lag or latency. The NVIDIA GRID technology should reduce game server latency by up to 30 milliseconds compared to prior solutions, which effectively hides the network delivery time. They also claim that gameplay from an NVIDIA GRID server feels like that from a console next to a TV. 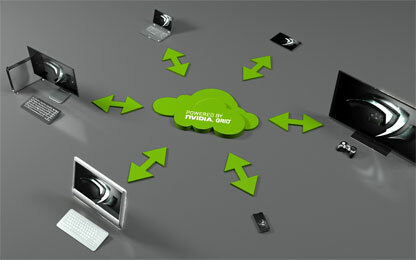 NVIDIA GRID provides a high number of concurrent, interactive data streams by using multi-GPU servers and sophisticated NVIDIA VGX technology that includes the NVIDIA VGX Hypervisor, which allows multiple users to share a GPU. Each server can deliver up to 36 game streams, bringing a dramatic reduction in the cost and amount of power consumed per game stream for cloud gaming operators. Going into detail the NVIDIA GRID server architecture consists of server racks that are able to accommodate up to 20 GRID servers bringing the total count of NVIDIA Kepler GPUs up to 240. NVIDIA says this is equivalent to 200 TFLOPS of computing power, roughly equivalent to the computing power of 720 Xbox 360 consoles, and should be enough to serve up to 720 concurrent gamers per rack and have up to 7,200 subscribers per rack. Based on the pictures provided by NVIDIA and the total of 200 TFLOPS of computing power for the server racks, it looks as though NVIDIA is using low end entry-level Kepler GPUs on the graphics cards that make up a GRID server. 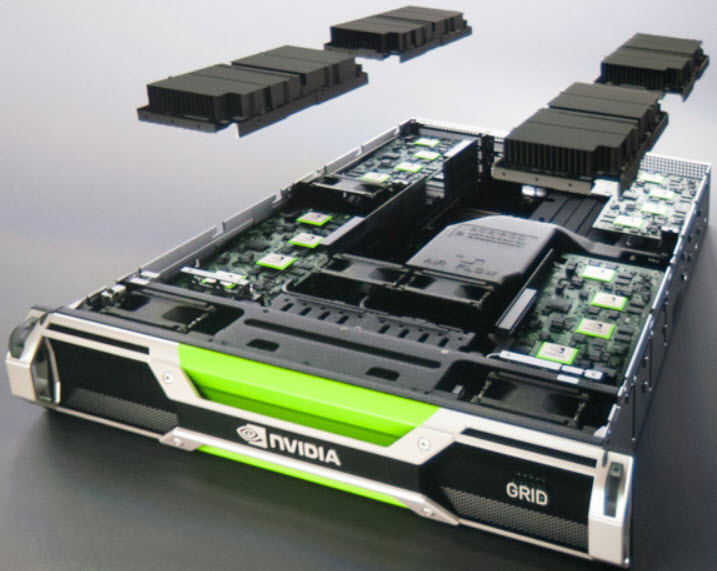 NVIDIA is calling said graphics cards GRID K1 boards and one GRID server consists of 4 GRID K1 boards with each GRID K1 board containing 4 entry-level Kepler GPUs and 16 GB of DDR3 graphics memory, allowing it to support up to 100 users on a single board. Each GRID K1 board has a total of 768 NVIDIA CUDA cores, a TDP of 130 W and a passive cooling solution compatible with server installations in data centers. When one takes into account that one GRID K1 board contains 4 Kepler GPUs, one GRID server 4 GRID K1 boards and one NVIDIA GRID server rack up to 20 GRID servers, this should add up to 320 Kepler GPUs in one NVIDIA GRID server rack. But the information provided by NVIDIA states that up to 240 Kepler GPUs can be included in one NVIDIA GRID server rack. So where are the remaining 80 Kepler GPUs? It could well be that NVIDIA wasn't able to accommodate them because of power and/or cooling constraints. I do wonder how they configure the racks then? They could leave 5 GRID server slots empty which would be a waste, the option where they wouldn't use one Kepler GPU on the GRID K1 boards either by not including it or disabling it is also highly unlikely, more likely is that they simply only install 3 GRID K1 boards in each GRID server. Other combinations of Kepler GPUs, GRID K1 boards and GRID servers would be possible, but highly unlikely. Perhaps NVIDIA will shine more light on this situation and if these numbers are really correct fix this problem. When NVIDIA unveiled the GeForce GRID cloud gaming technology in May of last year they presented it with the high-end GRID K2 board that features 2 high-end Kepler architecture-based GPUs, each with its own video encoder, and has 3,072 CUDA technology cores and around 4 TFLOPS of computing power. This makes the GRID K2 board similar to the flagship NVIDIA GeForce GTX 690 dual-GPU graphics card for gaming. But unlike the GeForce GTX 690, it features 8 GB of GDDR5 graphics memory and 320 GB/sec memory through output. The GRID K2 board is rated at a 225 W TDP and has a passive cooling solution compatible with server installations in data centers. If NVIDIA is really having problems accommodating all the entry-level Kepler GPUs into GRID server racks because of power and/or cooling constraints, then it's no wonder why they haven't released GRID with the GRID K2 boards which require nearly twice the power of the entry-level GRID K1 boards. Also the fact that a GRID K2 board is very similar to the flagship NVIDIA GeForce GTX 690 dual-GPU graphics card that is priced at $1000, surely isn't a seller for prospective price conscious cloud gaming customers. Looks like cloud gamers will have to make do with entry-level graphics for some time as cloud gaming startups can't afford the high prices of high-end NVIDIA GPU hardware, like many PC gamers can't. Many have scoffed at OnLive's graphics and proclaimed that NVIDIA GRID powered cloud gaming services will roll over OnLive, it looks like fairies alone can't buy high-end graphics as OnLive has learned the hard way, and even NVIDIA chose to demo GRID at their CES 2013 press conference with Trine 2, a game with fairly modest hardware requirements, instead of the soon to be released high-end PC hardware melting Crysis 3. If NVIDIA GRID really comes equipped with the entry-level GRID K1 boards, then it looks like cloud gaming service providers and services that want to stream games with maxed out graphics powered by NVIDIA's GeForce GRID cloud gaming technology will have to purchase the expensive high-end GRID K2 boards and install them into custom made servers and racks by other manufacturers for the time being. I wonder what company is brave and/or crazy enough to do this, and even more importantly has the money and the balls to spend it? I wouldn't count on cash-strapped Sony with their Gaikai acquisition for their upcoming PS Cloud, maybe Microsoft for the Xbox cloud, though Apple has the money they lack the balls to spend it and rather hoard it, and you can never know with Google. The NVIDIA GRID SDK is available now and features GRID game servers, the SDK for GRID client software, cloud games, and one year of technical support. NVIDIA claims that their dedicated developer team has worked side by side for over a decade with hundreds of developers to ensure that the best game titles are ready for NVIDIA GRID, and by lending engineering and hardware support to game developers, NVIDIA assures that games perform great on NVIDIA hardware. NVIDIA's initial partners for GRID are cloud gaming providers Playcast that is based in Israel, Japan based G-cluster, Taiwan based Ubitus, US based Agawi, Cloud Union and Cyber Cloud both from China. 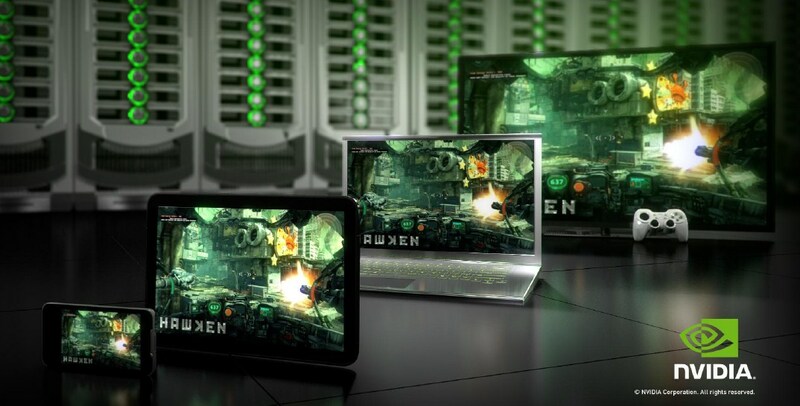 These partners will use NVIDIA GRID for the many cloud gaming services that they operate around the globe. "By using the NVIDIA GRID platform, our partners will allow gamers to play anywhere, anytime, without being tethered to a box," said Phil Eisler, general manager of cloud gaming at NVIDIA. "The world's most exciting games can now be played as easily as you can stream a movie, right onto your TV or mobile device. No more discs to shuffle or files to download and install. Just click and play." "Cloud gaming is taking off. NVIDIA GRID technology, Smart Connected TVs and Playcast Media will serve as cloud gaming's catalyst, fueling its explosive growth in 2013," said Guy De Beer, chief executive of Playcast Media, which provides cloud gaming services to more than 1.2 million subscribers through France's Bouygues Telecom, South Korea's CJ HelloVision and Portugal Telecom's MEO Jogos. "As the pioneer in cloud gaming, G-cluster is always looking for ways to increase the performance of our service. G-cluster is working with NVIDIA to reduce the costs for our IPTV operators and improve the experience for our subscribers around the world," said Erik Piehl, president of G-cluster, which provides white-label cloud-based gaming services through France's telecom carriers Orange and SFR. "Ubitus is pleased to partner with NVIDIA to bring the world's most scalable cloud gaming systems to market. Ubitus is the leader in providing cloud gaming over fixed and wireless 4G networks, empowering telecom/cable service providers, hardware OEMs and game developers to benefit from cloud gaming opportunities in a truly sustainable manner," said Wesley Kuo, CEO of Ubitus, which provides cloud gaming services through Japan's NTT DOCOMO with G CLOUD, South Korea's LG U+ with C-games and USA's Verizon with GameNow. "Consumers love the convenience of any game anywhere instantly, and therefore cloud gaming is the natural evolution of the gaming experience. NVIDIA GRID is a fantastic tool that gives cloud service providers the improved density to make true-GPU clouds a reality and allows our operator, publisher and developer partners to reimagine the gaming experience using the Agawi CloudPlay platform," said Rajat Gupta, co-founder of Agawi, which provides B-B cloud-gaming solutions for PCs, Macs, Smart TVs, tablets and smartphones. "In China we don't have game consoles. And therefore we see a large opportunity for cloud gaming in China. The NVIDIA GRID technology is the best that we have seen for delivering high densities of HD-quality game streams to subscribers," said Danny Deng, chief executive of Cloud Union, which provides cloud-gaming through China's Telecom/Unicom IPTV networks. "At Cyber Cloud, we focus on delivering cloud gaming services through existing set-top boxes using video-on-demand channels. With NVIDIA's GRID platform we can deliver large numbers of games-on-demand channels to China's digital TV subscribers," said Jian Han, general manager of Cyber Cloud, a subsidiary of Beijing Novel-Supertv Digital TV Technology, which provides cloud gaming through digital cable TV and IPTV networks. Curiously Gaikai isn't mentioned among NVIDIA's partners, though the two were quite cozy together in May of last year when NVIDIA unveiled the GeForce GRID cloud gaming technology with Gaikai CEO David Perry joining NVIDIA CEO Jen-Hsun Huang on stage and pledging support for NVIDIA and their technology. It may be that Gaikai will use the high-end GRID K2 boards in their cloud gaming data centers, but this doesn't explain the lack of mention by NVIDIA. More likely is that this may have something to do with the fact that Gaikai was acquired by Sony and Sony is rumored to be using AMD hardware in their upcoming PS4 console. It might very well be that Sony also wants to use AMD hardware for their upcoming Gaikai powered PlayStation cloud gaming service that will accompany the PS4 and that way making the game development for both upcoming Sony platforms easier, hence Gaikai being in bed with NVIDIA's enemy. AMD invested into cloud gaming technology provider CiiNOW and their hardware is powering CiiNOW's Cumulus cloud gaming platform. We should get a sneak peak at the as of yet unannounced cloud gaming GPU from AMD that is powering CiiNOW's Cumulus cloud gaming platform at CES 2013 and maybe AMD will reveal more info about their cloud gaming plans. It looks like NVIDIA is also out of the loop with OnLive, as OnLive is still using their proprietary hardware to stream games from the cloud. Since this proprietary hardware from OnLive enables some key attributes of the OnLive cloud gaming service like the Arena live massive spectating and Brag Clips, and OnLive's platform is very mature with many options like global voice chat, gamer profiles, friending and achievements, it isn't that easy for OnLive to just throw out years of development for another solution like NVIDIA GRID that may or may not be better. DreamHost is definitely one of the best hosting provider for any hosting plans you require. Cloud has changed the hosting services. Even, the games are available on the cloud. Looking for the custom gaming pc canada then, get it from versuspower computer.